When you think of Christmas, what comes to mind? Families getting together to wish each other peace and happiness in the new year? The delicious Christmas dinner, primarily fronted by a turkey, goose, or even a juicy succulent ham? The shimmer of a Christmas tree in the morning with a vast sprawl of presents for everyone underneath? Yes, the spirit of the season remains alight in all the hearts of the many who celebrate its joy, no matter what you're doing or who you're doing it with. But when I think of Christmas, I think of chicken. And not live chickens, either. I think of dead chicken, skinned, separated, battered, deep-fried, and served to me in a paper bucket. That's right: KFC stands for Kentucky Fried Christmas. And what better way to enjoy sitting alone in your apartment, pantsless, knee-deep in oily poultry runoff on Christmas Eve than with a special medley of all the greatest holiday hits, hand-selected by the man himself. It's Christmas With Colonel Sanders, released way back in 1969 at a time when apparently there was some respect left for KFC and when people would actually buy music at a fast food restaurant. I can imagine it now: "Yes, can I get a 10-piece bucket, a side of fries... oh, and that giant vinyl over there. Yeah, put it in the bag; I want my record to smell like chicken." Charley Pride - "Out Of The Eash"
Arthur Fiedler / Boston Pops - "Sleigh Ride"
John Gary - "Have Yourself A Merry Little Christmas"
Morton Gould - "Good King Wenceslas"
Kate Smith - "O Holy Night"
Harry Belafonte - "Mary's Little Boy Child"
Chet Atkins - "Jingle Bell Rock"
Lorne Greene - "Merry Christmas Neighbor"
Peter Nero - "My Favorite Things"
Sergio Franchi - "The First Noel"
Lana Cantrell - "I'll Be Home For Christmas"
Henry Mancini - "Carol For Another Christmas"
Now here's the thing: this compilation of festive ditties isn't bad by any means. Coming from 1969 and earlier, these songs hail from a simple and more humble era when such songs still had even a little emotion left in them. There was no Justin Bieber pooping out a Christmas album filled with holiday anthems about "gettin' some under the mistletoe" to fulfill some contractual obligation. You won't find any jive carols about twerking under the tree or how all I want for Christmas is "bae". These are orchestrated numbers, with the vocalists working hard to show off their singing chops. This was how these songs were meant to be heard: with heart and feeling. I particularly enjoyed the piano stylings of Peter Nero's "My Favorite Things"; I wish I could play piano like that or make my piano SOUND as off as that one. I will say, however, that having members from the show Bonanza, including a character who is called "Little Joe", seems a bit tacky. Back then, this was the equivalent of having a rapper guest star in a pop track. This album is indeed pleasant to listen to; it's only tainted by corporate affiliation — the combination of merry sentiments with the input of a massive multi-national corporation. I highly doubt that Colonel Harland Sanders himself took a break from counting his assets as he rocked peacefully on the front porch of his poultry plantation (a stereotype, I know) to personally hand-select the songs on this album. I'd be surprised if he had even known of its existence. Ah, well. At least this album doesn't feature a guest spot from Cali Swag District, shouting "Teach me how to Double, tea-tea-teach me how to Double Down!" 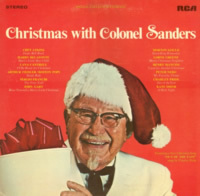 After listening to Christmas With The Colonel, I can't punish it entirely for its undertones of advertising, especially since the final product has absolutely nothing to do with KFC. This collection itself is quite pleasant and harkens to a more pleasant and pure time in music in general. So why not grab a bucket of the Colonel's finest extra crispy blend, put on this lovely vinyl, and have a holly jolly coronary.